Would having your coffee with splenda instead of sugar make this cookie even more hazardous for your glucose metabolism and what about your waistline? If you've listened to yesterday's installment of the science Round-Up your are probably already in the know of the most important facts about the "pro-insulinogenic" effects of sucralose and how it is (a) neither sure what exactly is causing this increase in post-prandial insulin release, nor (b) whether this is the "bad thing" conventional wisdom would dictate it is. "The elevated insulin response could be a good thing, she pointed out, because it shows the person is able to make enough insulin to deal with spiking glucose levels. But it also might be bad because when people routinely secrete more insulin, they can become resistant to its effects, a path that leads to type 2 diabetes." Almost as interesting as the things, the researchers did observe were yet changes they didn't observe, namely differences between conditions in active glucagon-like peptide 1, glucose-dependent insulinotropic polypeptide, glucagon incremental AUC, or indices of the sensitivity of the β-cell response to glucose. Why this is important? Well, actually you would expect increased GLP-1 and GIP levels, lowered glucagon (the hormone that will have your liver produce glucose) and an increased sensitivity of the b-cells to glucose (why else would there be more insulin floating around), but none of these effects was observed. So what's the mechanism here, then? Just like the scientists themselves state: "Although we found that sucralose affects the glucose and insulin response to glucose ingestion, we don’t know the mechanism responsible." (Pepino in an interview with the press guy from the University) and we don't know if these effects of sucralose / splenda are obesity specific or will occur only transiently and disappear upon continuous exposure. From another artificial sweetener, namely Acesulfam-K we know that it can also increase the influx of glucose across the intestinal border by increasing GLUT-2 receptor expression (Zheng. 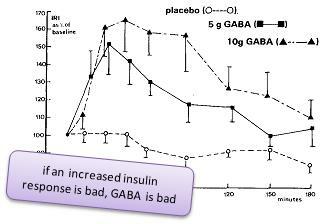 2013), so that this would a third - indirect effect on the insulin response that cannot be totally discarded. In other words, chronic users won't be experiencing the effects that were observed in the study, but they will necessarily have a slightly increased insulin response to everything they eat (as long as they are healthy and not yet insulin resistance) irrespective of whether they consume it with or without non-nutritive (not just artificial) sweeteners. 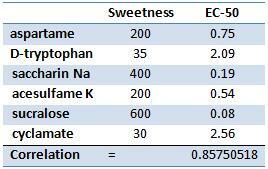 Being ~300x sweeter than sucrose stevia would by the way be somewhere between acesulfame K and saccharin Na and there is no reason to assume it would not have the same effects, only because it is "natural". I fact the observation Anton et al. made in a 2010 study, where the preingestion of stevia yielded a greater initial glucose spike and a correspondingly higher increase in 30min post-prandial insulin levels than aspartame (~37%) (Anton. 2010). These results clearly suggest that stevia is probably no exception to the rule (it could yet also be that aspartame is an exception to the rule, cf. "Aspartame's Anti-Insulinogenic Effects During a Workout"; read more) - unfortunately the differences in the study design don't allow for a direct comparison of the Anton and the Pepino study. And how bad is that? If we don't really know what the mechanism is and who will be affected to which degree, do we at least know how bad the observed changes are? Unfortunately, the answer is "No", but the notion that any increase in insulin would be bad for you is clearly flawed. If you did not listen to the podcast yet, you are now probably asking yourselves: "Hold on, but does that not set you up to become obese?" The answer would certainly be yes, if you were insulin resistant, would not work out and would follow a hypercaloric diet with tons of carbs and fats. 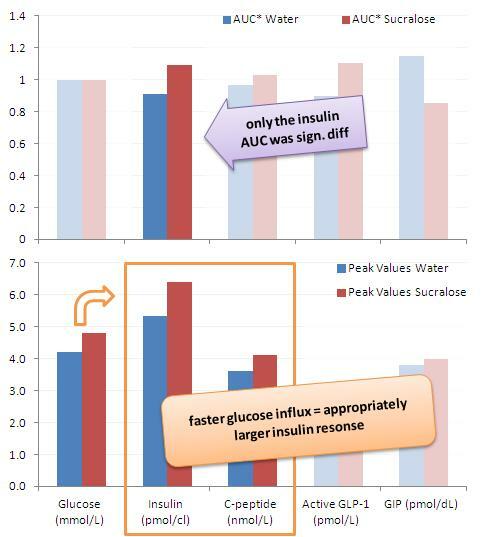 If that's not you, the actual effect of insulin on fatty acid synthesis and thus the amount of carbs that is stored as fat will be of a >20x lower magnitude than the effect insulin exerts on the storage of muscle glycogen - if you extrapolate the data from the first 20min of the euglycemic clamp data figure 3 is based on the ratio could be as high as 2,000x (in other words for each 1 unit of glucose being converted to fat, 2,000 units will be shuttled into the muscle). "That's all bullocks? Insulin is bad *fullstop*"
"Where's my Splenda I want more Splenda!" We don’t know about long-term consequences. Will the increase remain or will we “depend” on the artificial sweetener to get an adequate insulin spike in the future (remember the study participants were non-users before)? In the same vein, we don't know what the consequences of the increased intestinal glucose absorption in response to chronic use (if it is actually present in humans) will be. Moreover, although previously published studies don't support this, you could develop an even more pronounced sweet tooth and totally mess the self-regulatory mechanism for food intake that is skewed in the "average Westerner", anyways. Importantly, the effects are probably different in the obese + insulin intolerant for them the spike in insulin will have little benefits and tons of downsides (the beneficial effect cited above wrt to the glucose disposal in muscle are probably irrelevant), so that exactly those people who are targeted by artificially sweetened foods could see negative effects which may not be present in lean individuals. And if all that is not convincing enough, just remind yourself that we do not even know what exactly is going on here. Bottom line: It does therefore not appear to be indicated to change whatever has been working for you in the past. I can guarantee that you are NOT stagnating because you use a sweetened whey protein or BCAA product. 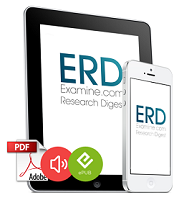 The evidence simply is not there or as Renwick et al. put it in their review, there is "no consistent evidence that low-energy sweeteners increase appetite or subsequent food intake, cause insulin release or affect blood pressure in normal subjects." (Renwick. 2010). Finally, I guess, I don't have to mention this, but still: I will keep you posted on any future research. Anton SD, Martin CK, Han H, Coulon S, Cefalu WT, Geiselman P, Williamson DA. Effects of stevia, aspartame, and sucrose on food intake, satiety, and postprandial glucose and insulin levels. Appetite. 2010 Aug;55(1):37-43. Del Prato S, Tiengo A. The importance of first-phase insulin secretion: implications for the therapy of type 2 diabetes mellitus. Diabetes Metab Res Rev. 2001 May-Jun;17(3):164-74. Del Prato S. Loss of early insulin secretion leads to postprandial hyperglycaemia. Diabetologia. 2003 Mar;46 Suppl 1:M2-8. Koopmans SJ, Mandarino L, DeFronzo RA. Time course of insulin action on tissue-specific intracellular glucose metabolism in normal rats. Am J Physiol. 1998 Apr;274(4 Pt 1):E642-50. 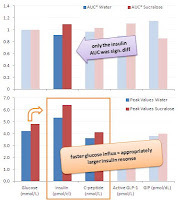 Kosaka K, Kuzuya T, Hagura R, Yoshinaga H. Insulin response to oral glucose load is consistently decreased in established non-insulin-dependent diabetes mellitus: the usefulness of decreased early insulin response as a predictor of non-insulin-dependent diabetes mellitus. Diabet Med. 1996 Sep;13(9 Suppl 6):S109-19. Lillioja S, Nyomba BL, Saad MF, Ferraro R, Castillo C, Bennett PH, Bogardus C. Exaggerated early insulin release and insulin resistance in a diabetes-prone population: a metabolic comparison of Pima Indians and Caucasians. J Clin Endocrinol Metab. 1991 Oct;73(4):866-76. Masuda K, Koizumi A, Nakajima K, Tanaka T, Abe K, Misaka T, Ishiguro M. Characterization of the modes of binding between human sweet taste receptor and low-molecular-weight sweet compounds. PLoS One. Nakagawa Y, Nagasawa M, Yamada S, Hara A, Mogami H, Nikolaev VO, Lohse MJ, Shigemura N, Ninomiya Y, Kojima I. 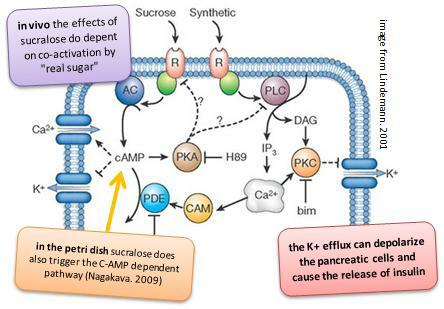 Sweet taste receptor expressed in pancreatic beta-cells activates the calcium and cyclic AMP signaling systems and stimulates insulin secretion. PLoS One. 2009;4(4):e5106. Pepino MY, Tiemann CD, Patterson BW, Wice BM, Klein S. Sucralose Affects Glycemic and Hormonal Responses to an Oral Glucose Load. Diabetes Care. 2013 Apr 30. Renwick AG, Molinary SV. 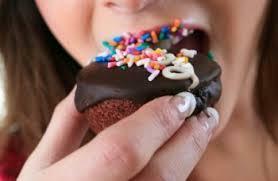 Sweet-taste receptors, low-energy sweeteners, glucose absorption and insulin release. Br J Nutr. 2010 Nov;104(10):1415-20. Zheng Y, Sarr MG. Effect of the artificial sweetener, acesulfame potassium, a sweet taste receptor agonist, on glucose uptake in small intestinal cell lines. J Gastrointest Surg. 2013 Jan;17(1):153-8.